If you've come to play this slot expecting some spin-off version of IGT's classic board game slot Cluedo then you will be in for a very big disappointment I'm afraid. This is a unique slot released from the whizz kids at NetEnt based on the popular Scandinavian online casino called Mr Green. Mr Green is slowly taking on an identity of his own. The online casino also appears to be working closely with NetEnt these days. Only recently, the online casino released a promotional banner for the NetEnt-developed slot The Wish Master that showed the character of Mr Green checking out a gold lamp in a mysterious cave. 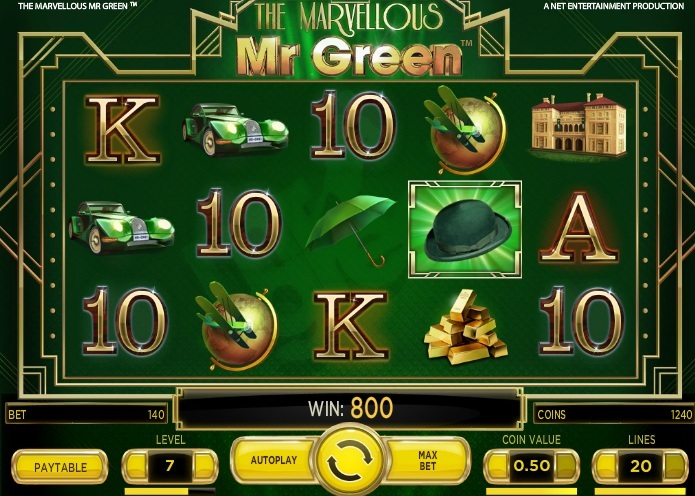 The Marvellous Mr Green is a 5-reel, 20-payline slot developed by NetEnt exclusively for Mr Green's online casino. If anything showed that bounds between NetEnt and Mr Green could not be stronger then this slot release does exactly that. The focus is, of course, on the character of Mr Green himself. Symbols across the reels include various items in green. There's a posh green car, a lovely green umbrella, a green plane, a mansion that has some green grass in front of it, and the a pile of gold bars. There is also the chance for you to win up to 463,050 coins on this slot. The Wild is represented by the trademark green bowler hat of Mr Green. It substitutes for all other symbols, except for the Scatters and the Multiplier Meters, to complete winning combinations and help you earn some big pay outs. The Scatters come in the form of the Mr Green casino chip. If you manage to hit three or more of these delights across the reels then you will trigger the free spins bonus round. Once this feature is triggered, there will also be the chance for you to hit the Multiplier Meter symbol on reel 5 that can multiply your winnings by up to 6x during the free spins bonus round. Trigger up to 5x Multipliers Randomly at Any Time! There is also a random multiplier feature on this slot. Every time you manage to complete a winning combination then you will see a random multiplier value pop up that will be added to your winnings. This value can be up to 5x your win which makes it a nice little earner to have included. The Marvellous Mr Green is an interesting slot. 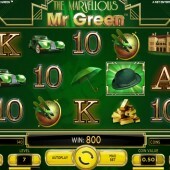 It is clearly a gimmicky slot that has been released with the intent of expanding the Mr Green brand through NetEnt. However, the free spins bonus round and the large presence that the multipliers have on this slot means that you end up being a bit more hooked than you feel you should. I went into this slot thinking it would be free spins bonus and that would be it. I was pleasantly surprised. Obviously, it is no Terminator 2 blockbuster slot but for a release that stayed under the radar, it's not that bad at all.